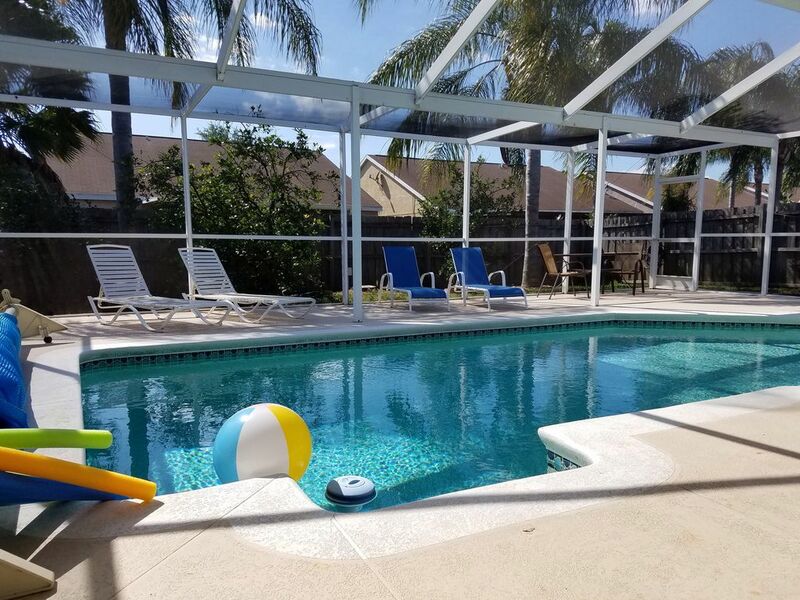 Vacation home with your own private pool in your backyard with tons of space to enjoy sunny Tampa Bay! Relax on one of our lounge chairs or float around the pool, you get to choose as it's your vacation! Close to Tampa, Orlando and some Great Beaches. Great place to come and enjoy the Florida Lifestyle. Well maintained 3 bedroom, 2 bath home. Master has an ensuite bath with oversized walk-in shower. Guest rooms are on opposite end of family room and share a large bath with tub/shower combination. The dining area overlooks the beautiful private pool. Kitchen has side by side fridge, Stainless smooth surface range, built in microwave and dishwasher. Lots of small appliances like a toaster, toaster oven, blender, coffee maker, pots & pans and loads of dishes. Full size washer and dryer, and I make sure you have plenty of linens including beach towels. Washer and Dryer are free and located in the garage. 1 Mile to amenities such as grocery (Publix and Winn-Dixie, Panera Bread, Starbucks, Sams Club, Bealls Dept Store, Gas Stations, Banks and so much more. The home is located in a residential neighborhood. Beautiful hardwood floors in all living areas, ceramic tile in the baths - NO Carpet which is great for allergies and just knowing that the floors are clean! Sliding doors lead to the private screen enclosed swimming pool and extended pool deck in the backyard which has a 6ft privacy fence surrounding the pool area. Community itself has 2 pools and a playground, sidewalks for evening strolls through the neighborhood. New State of the Art Movie Theatre just opened in 2017 in Gibsonton. Downtown Tampa is approx 20-25 minutes, grocery shopping less than 1 mile away at the corner of US 301 and Big Bend - Interstate is about 3 miles away - we are at exit 246 off of I-75 which is the Apollo Beach exit. We enjoy vacations in private homes we decided that it was time to let others enjoy our lovely pool home when we purchased a new home. Currently I live about 3 miles from the home and am a Florida Licensed Realtor, I can help you find your dream home in Tampa Bay. Great location - Grocery & Shopping within a mile. Highway approx. 3 miles away - very easy access to all of Tampa Bay. Huge pool area with plenty of space to relax. Home has it's own personal pool which is approx. 14 X 28. New walk-in shower in the master bath, and new tile in both bathrooms. No tub in the master bath - oversized shower (see pictures). Riverview within 1-2 miles you will find lots of restaurants, several coffee shops, breakfast places, 3 grocery stores, loads of fast food, department stores, gas stations and loads more. I provide plenty of linens. You will find all the towels, beach towel and blankets you will need. I provide at least 1 spare set of sheets per bed. Electric fireplace in the family room. Two parking spots in the driveway. NO parking for RV or boats. Plenty of off-site storage if you have a boat or RV. The washer & dryer are located in the garage. The garage is used for storage only - no cars. It is a one car garage. Spectrum internet, television and phone service. 100 Mbps, NO data caps and they never throttle speed (according to website) plus free calling throughout US and Canada. Lots of towels for the bathrooms, beach and kitchen dishcloths and dishtowels are provided. My great room area has seating for 6 comfortably. You can also pull in a chair or two from the master bedroom or dining table. Choice of Keurig or Drip Coffee maker. salt, pepper, oils and misc items are provided. Set of Dishes for 8. Eat-in Kitchen with lots of dishes, pots & pans, coffee station, full size appliances, toaster oven, slow cooker and loads more. If you need something specific ask me about it, good chance I have it! Great room type of home, open concept. 3 televisions and 3 DVD players. (1 is a blu-ray player). 3 DVD players - 1 of which is a Blu-ray player. Several board games for kids and adults. Miscellaneous videos for kids and adults. Backyard with orange, grapefruit and lemon trees - 1 of each, yard has a 6 foot privacy fence. Covered patio referred to as a Lanai in Florida. Home is 1 level home, front entry has a slight step up as does the access to the pool area. Shower in master bath is a step in/over NOT Roll in. Screened in private pool in your backyard. Solar heating panels on roof (7 panels total) plus solar blanket and liquid blanket added weekly. Pool has western exposure lots of afternoon sun! Hardly when we go to vacation we feel 100 percent relaxed. Staying at this house has definitely done the job! It felt just like home, plus Cheryl was always caring and going out of her way to make sure we had the best time possible. We will definitely stay there again!! Was very satisfied. Cheryl was great & very helpful. Made the process of renting easy. House & location very efficient. Pool at the home was great. Home was well kept & had almost everything we wanted or needed. This lovely 3-bedroom home was absolutely perfect. It was neatly kept, had plenty of room, was in a quiet and safe neighborhood, and the pool is amazing. The owner Cheryl was available if we needed anything and she took the time to personalize our visit by leaving some little extra things for our 2 years old grandson (high chair, pool toys, etc.). Cable TV and wifi plus coffee maker, washer and dyer and dishwasher, we had everything we needed. If we ever get back to the Tampa area, we would not hesitate to stay here again. This was everything we could ask for and more in a vacation rental. This was our second year at Cheryl's house. She is an excellent property owner and will do whatever is needed to make the stay comfortable. The house is very clean and in a quiet neighborhood. We would stay longer if we could. Already booking for next year. Had a great stay. The home was wonderful and the pool fabulous. We loved the birdcage screen that kept bugs out but let sun in. House was extremely well outfitted. Highly recommended. Tampa International Airport is 35-45 minutes. Riverview is located South East of Tampa and is centrally located getting around Tampa Bay. Short drive to Bradenton Beaches and Sarasota. Easy access to I-75 and I-4 to head to Orlando to visit one of our amazing theme parks. Just minutes away from everyday amenities, yet guests tell me how the stress slipped away when they stepped inside my home. Take your time, review the pictures and all the amenities our home has to offer you. You will find boating, shopping, sight seeing and amusement parks just minutes away! Pets - I do accept dogs of all sizes a pet fee of $200 is required for each pet. My insurance carrier does not allow aggressive breeds, therefore I require the breed and age of the dog at the time of reservation, we do not allow puppies and we expect your dog(s) to be trained and housebroken. We also expect you to pick up after your pet(s) if they are allowed out in the grass area. 100% of payment is required 60 days prior to arrival. For arrivals booked within 30 days of arrival full payment is due at time of booking. 50% of payment is required 60 days prior to arrival. For arrivals booked within 30 days of arrival full payment is due at time of reservations. Additional guests - 6 guests is what the price per week includes. If you request to have additional guests spend the night the cost is $150 per week. Nightly cost is $25 per night if under 6 nights.